Roderick enjoys his quiet, uneventful life as a herbalist but luckily for us we meet Roderick on the day this all comes to an end – when he becomes Sir Roderick, having just saved Queen Emily from the effects of a poison dart. Between poor Sir Roderick being stung on the bum by a bee in front of the Queen, being attacked by a drop python in a scary forest, and having his ear talked off by a very chatty bear, you’d hardly think there would be any time for him to complete the quest set by the Queen. 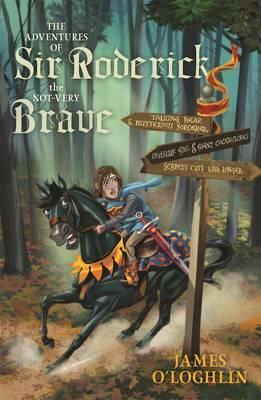 But our Sir Roderick does more than just that, and along the way he learns the truth in his father’s words: ‘It’s only those who feel fear who have the chance to be brave.’ This is a great book for readers aged 8 and up, although frankly, I would recommend making this a book you read with them – it’s far too much fun just for kids. Will Bruno and his family have a perfect day at the beach? Bruno was too excited for his jam toast. Today was his Big Day. Today, Bruno wasgoing for a swim. A swim in the sea -- the big blue sea. But will he be brave enough? Roderick doesn't want to be the knight who has to protect the kingdom! Isn't there someone else who can do it?